Who would mind the extremely long journey when it is to visit one of my favorite places, once more. Off for a few weeks down below, to New Zealand, Melbourne and Tasmania. C’est nous ! I packed my camera and the bare minimum, in the hope to be bringing back tons of great memories, pictures and stories. P. and I cannot wait to visit the South Island fjords, Otago, walk to Wineglass Bay, visit local markets and have fun with our dear friends down there. I need this vacation! And since our flight flights will be numerous and lengthy, so long that you do not want or need to know how much time it will take us before we arrive to our final destination, I thought that, while waiting for way too many hours at the San Francisco airport for example — anyone has a few spare hours to kill? 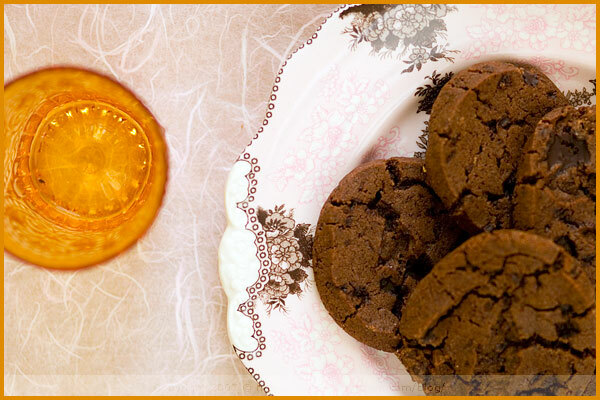 — both P. and I would deserve to nibble on a few batches of these delicious Pierre Hermé’s Chocolate Sablés. They are to-die-for! Some of you already know! Note: Sablé is shortbread in English, hence the texture of these sweet treats. In a large bowl, sift and mix together the flour, cocoa and baking soda. In the bowl of a stand mixer fitted with a paddle attachment (or a hand mixer), beat the butter until soft and creamy. Add the two sugars, the salt and vanilla extract and beat for 2 min or so. Add the flour and chocolate, and mix together until all the flour is absorbed. Do not overwork the dough, just enough until all the flour is well incorporated. Divide the dough in two halves and shape two logs, 1 1/2 inches in diameter, and place them in plastic wrap. Place in the fridge for about 2 hours (I even left them longer as I went out). Take the logs out of the fridge and remove the plastic wrap. Make slices 1/2 inch wide and place them on a baking sheet lined with parchment paper. Cook for about 11 to 12 mns in a preheated oven at 330 F. Remove and let cool on a rack (the sablés are fragile and will only get hard when cooling). Tamisez et mélangez la farine, le cacao et la bicarbonate de sodium dans un saladier. Travaillez le beurre en pommade (dans un mixeur à pied si vous en avez un, ou un mixeur à main) et ajoutez les sucres, le sel et la vanille. Mélangez bien pendant 2 min avant d’ajouter les farines et le chocolat en morceaux. Travaillez juste assez pour que toute la farine soit bien incorporée. Façonnez deux boudins de 4 cm de diamètre et enveloppez-les dans du film étirable. Mettez au frigidaire au moins 2 heures (j’ai même laissé plus longtemps car j’étais sortie entre-temps). Sortez les boudins du frigidaire et enlevez le film étirable. Découpez des tranches d’1 cm d’épaisseur et disposez-les sur une plaque de cuisson recouverte de papier sulfurisé (la pâte est friable, c’est normal). Mettez au four préchauffé à 170 C pendant 11 à 12 mns. Retirez et laissez-refroidir sur grille (attention les sablés sont fragiles et ne durcissent qu’une fois qu’ils refroidissent). Bonnes vacances Béa au bout du monde !! if you cross christchurch, drop by to say hello! I’d love to meet you. These sablés are insanely addictive. I *love* them (read: i could kill for them)! Profite-bien de tes vacances (mais je te fais confiance ;-)) et merci pour ces magnifiques sablés. What marvellous photos! I would love to vacation on such a spot! Enjoy, enjoy, enjoy! 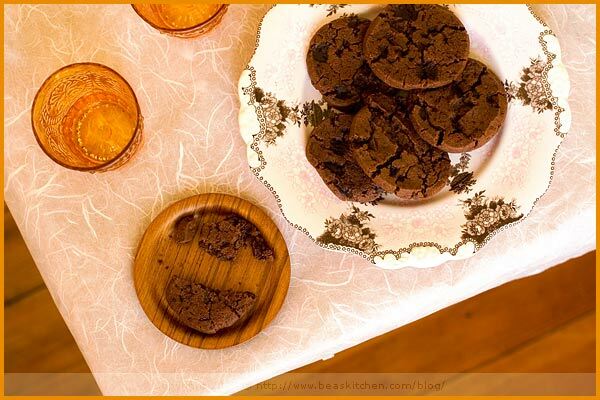 i love the pictures & the chocolate sablés of course, miam!! Oh lala tu me fais encore craquer, ma boite à cookies est vide, je vais la remplir en essayant ces petites merveilles. Bon dimanche. Have a great vacation Bea! I can not wait to see photos from your trip. Btw, I am crazy for Herme’s sables as well. Je te souhaite de superbes vacances! Profites-en. J’ai hâte de découvrir en photos et en mots tous les souvenirs que tu ramèneras. Très bonnes vacances (elles ne peuvent qu’etre bonnes!)! Happy Holidays & enjoy your trip to New Zealand Bea! What a tease you are! I’ve never been to Australia or NZ or had Sablé! Have a great time and bring every story and photo you can. I look foward to hearing (and seeing) the high points of the trip. Traveling with you is always a pleasure, Bea! I haven’t made it to New Zealand yet, but this will be the next best thing. Safe travels! wow these look absolutely delectable. your photos are fantastic. hope you enjoy your travels. i’ll be traveling at the end of the month — i cant wait to get away! it will be my very first time in Europe! i can’t wait to try this recipe. Lucky you! I hope you have a great trip! I’ve been to quite a few places, but never anywhere close to there. Bon voyage! Can’t wait to see all your wonderful photos! haha …. it’s cool to see someone so excited about coming to NZ … perfect timing too .. the weather is still hot & i went for a swim at the beach in the weekend and the water is still warm … hope you have a blast while you’re here … if you need any ideas on what to do, or where to eat in Auckland be sure to drop me a line! c’est une recette des plus gourmandes. I am always looking for new sables recipes for snack time.It looks delicious. Have a safe trip and bring us a lot of pictures. Have fun. A tres bientot. I just made a batch of these last week, they’re delicious! Welcome down under. If you want some insider tips on discovering the backstreets of Melbourne – or the local wine regions – just send a line. Ugh! Though the cookies look great all I can concentrate on is that you bake and make all these wonderful things and still get to wear a bikini! Those are some great genetics. 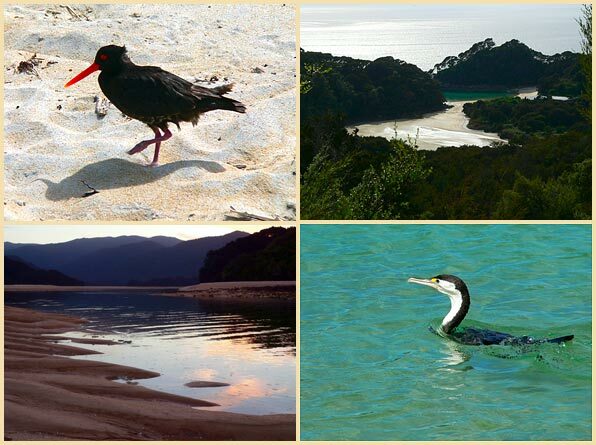 I loved the Abel Tasman shot. I’m a Canadian (married to an American and living in Philadelphia) and my husband and I spent 3 months backpacking, hiking, canoeing and kayaking our way around NZ a couple of years ago. Kayaking the Abel Tasman was one of my fondest memories. Thanks for the reminder! Enjoy my friend! Have a wonderful voyage! au réveil, la vision de ces sablés et de cette plage.. sont tout bonnement inhumains!! Béa tu es la tentation incarnée! c’est superbe !!!! je poste toujours le même commentaires mais à chaque fois je suis éblouie par tes photos !!! Such beautiful photos, Bea! Wow! Bon voyage amie Bea, je suis certaine que vous allez vous eclater. J’attends avec impatience tes magnifiques photos au retour. Qu’est ce qui me fait le plus réver? Votre voyage ou tes sablés?…. Have a wonderful trip Bea! Am looking forward to more of your gorgeous travel pics when you return! Above all else, you have made me want to go on holiday. I haven’t had time off work in almost a year now and it’s making me crazy! u have to stop clicking such fantasic pictures …u are killing me…u cant believe the stress i get when i see ur blog….when will i get as good at bea…when…arggggg…haha just kidding :–))…its always a pleasure to visit ur blog…and just for my info…who gets to eat all these lovely treats….u know u could ems them sometimes when u dont to what to do with them…i’ll mail u my add.!!! Perfect timing! I got online to look for a chocolate studded cookie to make but didn’t want to do regular old chocolate chip cookies. These sound great and will be made in a couple of hours. C’est bien la premiere fois que je suis plus fascinee par les photos de vacances que celles de biscuits au chocolat…je dois avoir de la fievre…! I’m so excited for you!!! And I’m already loving the photos. Is that your car in the first pic? 🙂 I like that photo the best for some reason. I can’t wait to hear all about the trip! If your trip means forthcoming photos of exotic birds, then I can’t wait til you get back!!!!!!!!!!!!!!!!!!!!!!!!!!!!! Profite bien de ton voyage. Moi, c’est le ski qui m’attend dès ce vendredi. Ce n’est pas la même chose, moi qui adore le soleil. Je vais me faire une fournée de tes gâteaux pour le voyage. beautiful photos Bea. Enjoy your vacation and I hope your suitcase gets packed with memories and inspirations. 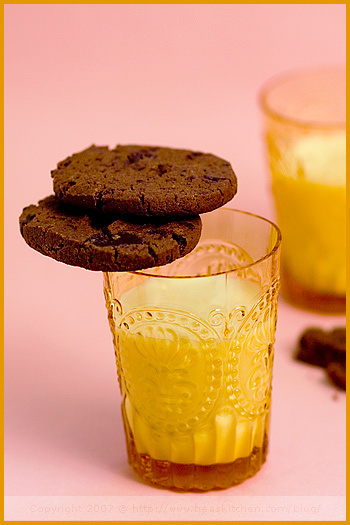 And as always, your cookies look lovely and I’m swooning over your cups & plates! Fanny, I would have loved to, but unfortunately, I am not coming to Christchurch at all ;-( We will be in Queenstown though! Sophie, oui pas mal ces sablés, n’est-ce pas ? Merci! Joey, yes this is a pretty nice place to spend time in! Thank you for your note. Sylvie, je te fais confiance pour bien la remplir, ta boite! Cenk, thank you very much for your words. Ninnie, merci. MOi aussi, j’ai hâte! Adèle, oui tu as raison, merci. Valentina, thank you my dear! Tanna, ahahh a tease, me? 😉 Thank you! Ellie, Yes I will be in Melbourne, but only for a day on our way to Tasmania, staying with a friend. I would have loved to meet you but it will just be too short I am afraid. If anything changes, I will let you know! Christine, thank you so much! I cannot wait to bring back tons of nice things to see! Michael, ah this is a fun coincidence indeed. So is the screenplay shot in New Zealand then, and if so where and when?? Linda, thank you! I hope you have a lot of fun in Europe. I am sure you will. Lisa, thank you. I cannot wait to shoot! Adeline, ahha tu es bien sage. J’espère que tu les aimeras. Sharon, thank you! Yes totally excited! It seems that we get down there every year now 😉 Unfortunately, we are not stopping in AUckland either (we spent a lot of time around there last February) and this time, will mainly travel in the SOuth Island and Wellington a little, to visit friends. Brilynn, oh good for you! I love them! Ed, thanks a lot! Unfortunately, I am not spending a lot of time in Melbourne this time, although I love the city (I visited it three times already). Hopefully another time! But many thanks! Peabody, you are too funny! I guess yes, Mother Nature was pretty good to me. 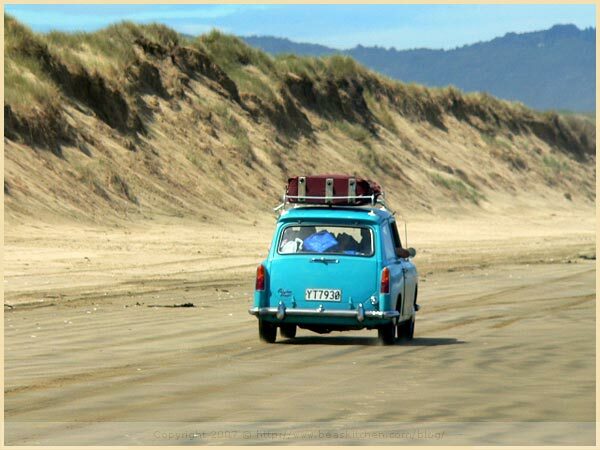 Carolyn, I am glad I could bring back nice memories to you, I love ABel Tasman NP too, we also kayaked there last year, did a 4 day trip in the park, sleeping overnight, kayak and walk. Loved it. I already hiked the place 3 times, I guess I must love it! But not this year as we head to Milford Sound instead. Alhya, ahahh, le diable, en quelque sorte! Sylvie, merci beaucoup. Bien gentil à toi de penser cela. Patricia, oh yes, impossible not to like these cookies, is it? Jeff, yes pretty cool, eh? Scott, I hope you manage to get away soon then. I bet this must make you crazy. Vacation should be compulsory! Kate, thank you! You are too funny! Makes me smile. Courtney, oh very nice, hope you like them. Helen, ahah oui tu dois avoir de la fièvre! C’est un bon signe, cela dit. Christine, thank you! not our car in the first pic but a car we digged! Rowena, I hope so yes!!! P. is like you, he LOVES to observe birds for hours! Could stay there undisturbed until one finally moves. Christelle, ah le ski, c’est super aussi. Profites-en bien. Et merci. Connie, thank you! I think the chocoholic in you would love these, yes! Oh Bea , I am speechless as usual with your wonderful photos! I have never tried the Pierre herme sables but looking at yours make me want to make them next! Bonjour Béa! Your sablés look absolutely amazing! A perfect snack for a well deserved vacation… play safe, and have a wonderful time! Have a great time Bea. Do call if you have time to share a glass of wine in Auckland. Gilly, thank you. I am exicted now as I am leaving in a day! Barbara, I will definitely keep in touch if we have time! I think you mean 11 Tb (tablespoons) of butter, not 11 tsp (teaspoons). What an amazing recipe though!! You leave today, yes? Have a great, wonderful utterly fabulous trip! 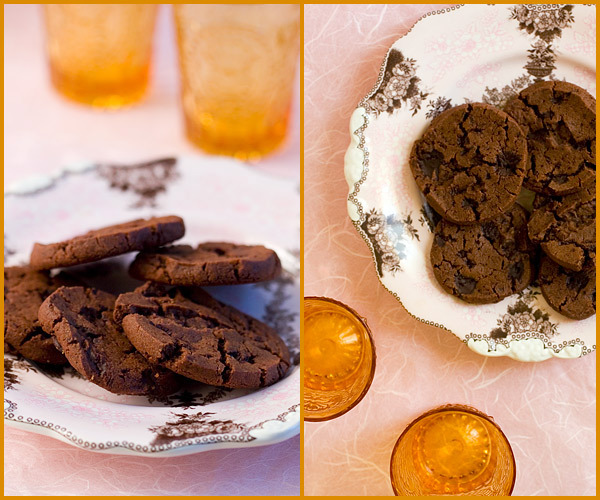 Ohhhh–while in Paris this past summer, I bought some of these chocolate sable cookies at his shop! Slightly salty and truly to-die-for…I will certainly make them at home! the notation is “tsp” for teaspoon and “Tsp” for tablespoon. I had checked to make sure that both Tsp and Tb or Tbsp were accepted, and they all seem to. But I will add Tbsp to lift any ambiguity. I finally made these tonight, as I had run out of brown sugar. They are SO good. The dough itself is the best I have ever tasted, and I could have eaten it with a spoon. Ca y est j’ai adopté votre blog ! hi Béa! I had been your blog a couple of times and I’m truly amazed the wondrous pictures! I went through a lot of your posts and I am so glad I found this one! I tried this recipe and it’s heavenly! Thank you for sharing and all the best! Il me fallait une bonne recette sans œufs et celle là a été parfaite ! Je la referais surêment. Avec des zestes d’oranges confits ça doit être super. Bravo pour tes photos, elles sont vraiment sublimes.